It is very important to keep reporting incidents of drug dealing and using on our streets and in the communal areas of our properties. By giving the police a clear view of the situation they will in turn have the ammunition they need to gain support from senior officers to tackle the problem. If we don’t report, they will not know the extent to which this is going on. Anyone wishing to join the Weavers Community Action Group or simply attend a meeting should email northweavers@gmail.com to receive information of future meetings. This entry was posted in Uncategorised on 21st September 2018 by Penny Creed. The Columbia Tenants and Residents Association has been actively working within the Weavers Community Action Group to tackle the ongoing problem of drug dealing on our streets and drug misuse on Tower Hamlets Homes properties. On Sunday 16th September an anti-drugs street art campaign appeared on streets in and around Columbia Road, Shoreditch, London, E2. 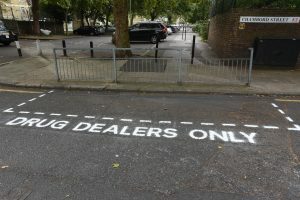 The artists, known as the Columbia Road Cartel had responded to a request for traffic calming measures to ease drug dealer car congestion in the area. Vice-Chair of the Columbia Tenants and Residents Association, Penny Creed said, “Drug dealing on our streets has reached astonishing levels with some local streets seeing up to ten deals in a single day. Dealers driving fast cars are putting residents at risk and users have been accessing communal spaces in properties to use on resident’s door steps. “The CTRA has spent time trying to work with agencies over the last few years to highlight the issue and support initiatives by the police, Tower Hamlets Homes and London Borough of Tower Hamlets. However, three years later little has changed. “Although there are some individuals trying to do their best to resolve this issue, cuts to police, mental health, drug and homeless programmes as well as council resources have hampered progress. This entry was posted in Uncategorised on 19th September 2018 by Penny Creed. Local residents concerned about drug dealing in the area are welcome to join the Weavers Community Action Group. Please email info@columbiatra.org.uk to join our email list to receive details of forthcoming meetings.